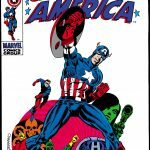 This is the final segment of our Marvel super hero annuals (specials) series with original content from the 1960’s. Our first two segments were pretty much all Fantastic Four and Spider-Man, here are the rest. This annual has already been well covered here on Comic Book Daily by Walter Durajlija and his Undervalued Spotlight #155 and by Clint McElroy in Doc Curmudgeon July 24, 2014. 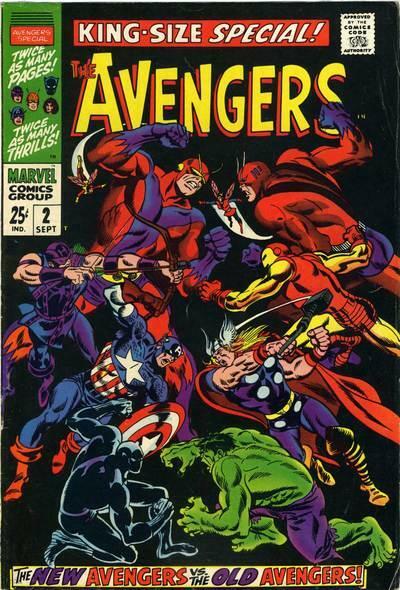 The only thing I can add is that Avengers annuals #1 & 2 were the first annuals I could find that had a direct link to the current continuity of the regular title. This is common practice now but these were the first and only books I could find from the 60’s that did this. 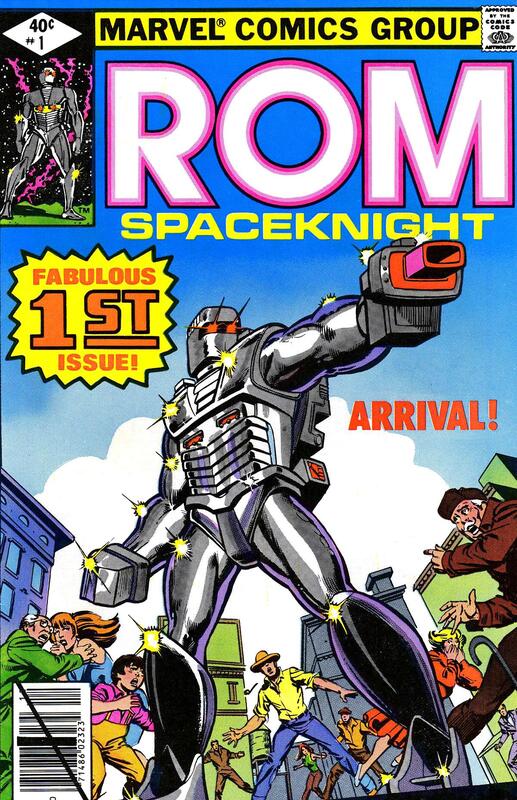 To quote Walter: This is the kind of comic book that makes comic collecting fun. 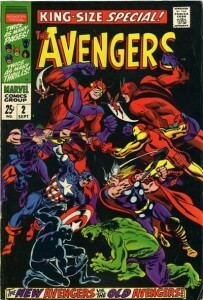 Avengers Annual issue 1 cover by Don Heck and George Roussos. Source. We just covered this book last month in Arcs & Runs. I confess that I had forgotten the connection to the regular continuity of Avengers #56-57 when I picked that run and started re-reading the books. The only add I have for this annual is just how tough this book is to find in grade. The beautiful black back ground face-off cover is very difficult to find in high grade. Current census numbers show 68 books graded in 9.0 or higher, but only five in 9.6 and zero in 9.8. It’s always been a tough book for me. 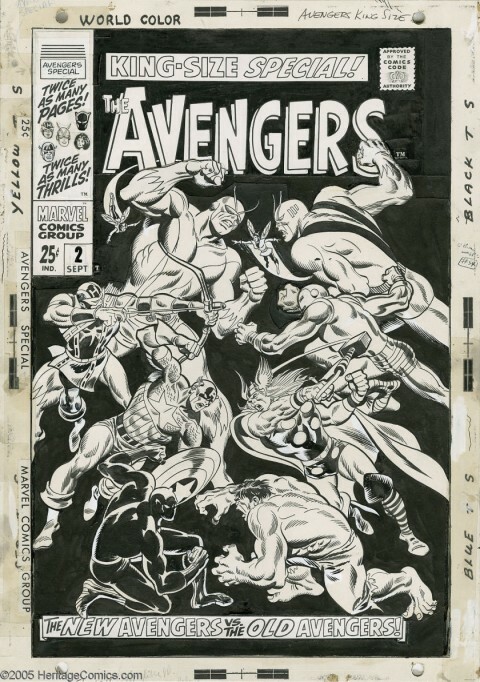 Cover and Interior art by Gene Colan with inking help from Frank Giacoia and Joe Tartaglione. Story by Stan Lee. 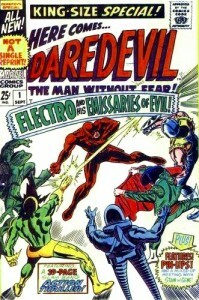 Daredevil gets his one chance at an annual in the 60’s with original content. I am being nice when I call this original as the book itself is a pretty close copy in format and story to Amazing Spider-Man Annual #1 and the Sinister Six. We won’t blame this on Stan, we will instead toss the blame at Electro who is a member of the Sinister Six but wants to start his own gang to tackle Daredevil and exact revenge upon him for his previous defeat in Daredevil issue #2. He rounds up other DD adversaries the Stilt Man, the Gladiator, the Matador, and Leap Frog to form his Emissaries of Evil. The Matador and Leap Frog are delighted that anybody would invite them to join a bad guy team. The story itself follows a similar pattern to ASM Annual #1 with Daredevil battling each of his foes individually and then the story takes a turn to the original. 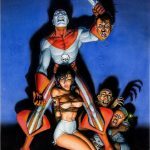 Electro bands them together to attack Daredevil all at once. In theory this should spell big trouble for DD but this group is still not a team. They act more as individuals all wanting to be “the one” who takes down Daredevil. 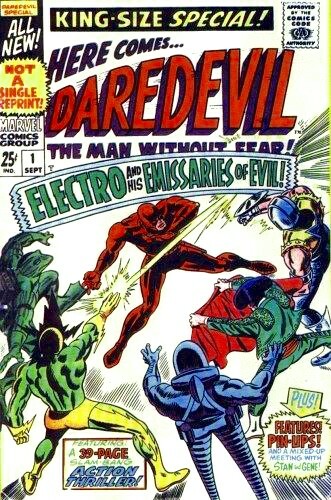 Daredevil uses this to his advantage and with some difficulty manages to take out this not so brainy gang as Electro and his Emissaries of Evil are defeated. Where is the Purple Man when you need him! The book is a fun romp for Daredevil fans and the rest of the annual is full of the usual pin-ups, rogues gallery, Daredevil facts and friends, and everything you ever wanted to know about DD’s billy club. This book is still pretty cheap and relatively easy to find in grade. A treat for Gene Colan fans and Daredevil fans in general, it is a fun book to own. 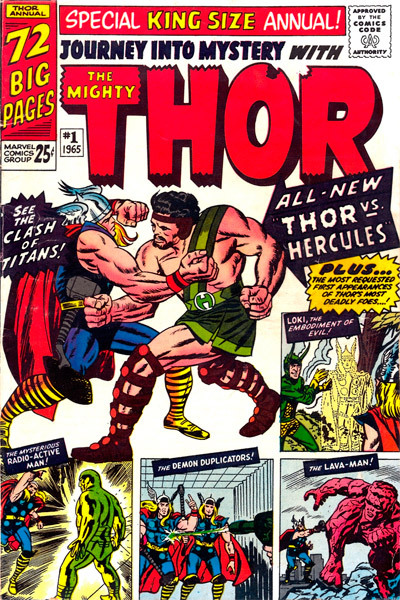 Cover art by Jim Steranko and Marie Severin. Interior art Marie Severin. Inking by Syd Shores, Frank Giacoia, and John Verpooten. Story by Gary Friedrich. I was pretty excited when I finally got to re-live this book. I have always loved the beautiful Jim Steranko cover on this book and the story about how he received the assignment to make the cover. I had read somewhere a long time ago (feels like an urban legend now) about how he had drawn, inked, coloured and lettered the cover for this book in one day( a Friday) and delivered the finished cover to Marvel in New York on the Saturday. 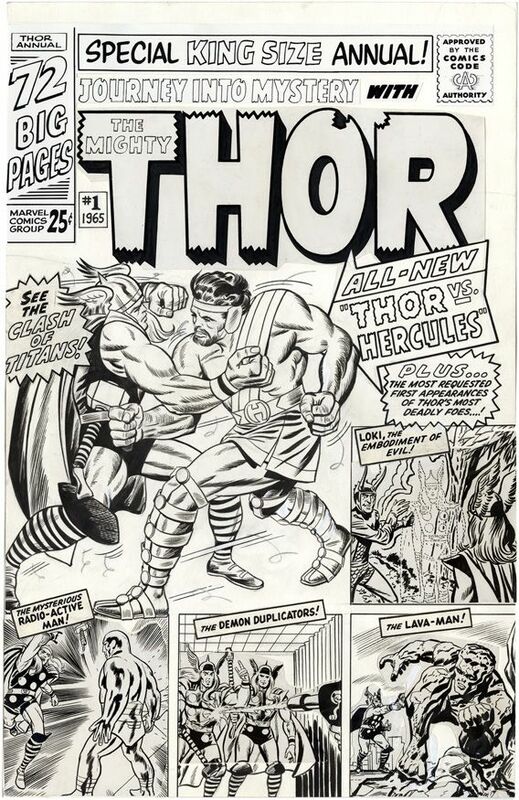 When I was re-confirming some particulars at the Marvel comic data base (great site) and I noticed Marie Severin had some cover credit for this book. What? Further investigation shows she had apparently re-drawn the Hulk’s face on the cover. 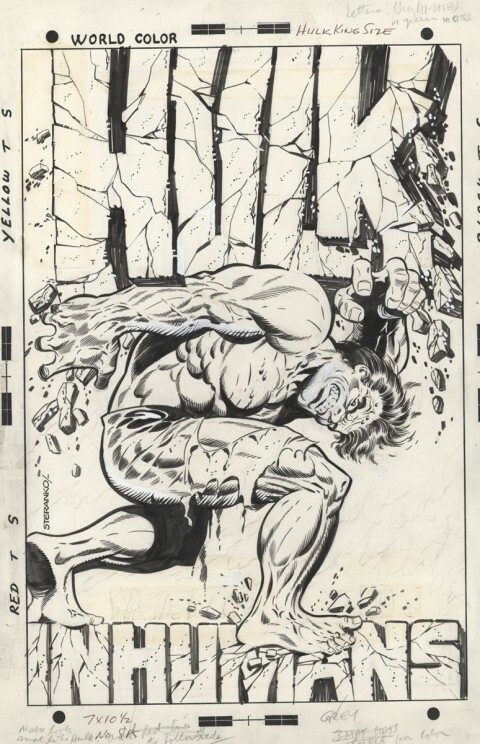 This apparently had been confirmed by Steranko himself via twitter “had drawn the Hulk’s head with sweat and bulging veins, but was told his version was “too fierce”. 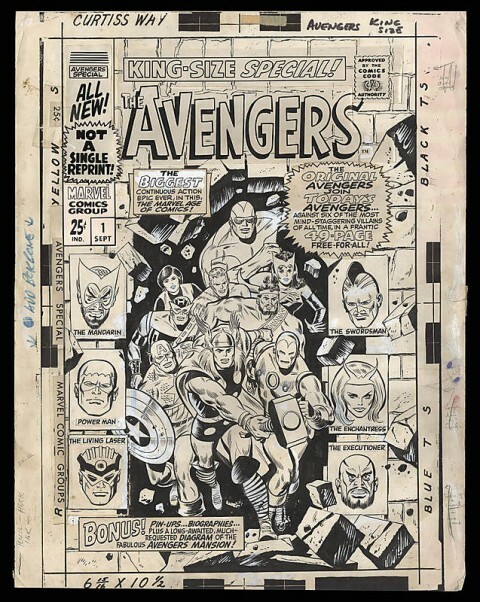 Apparently Marie Severin re-drew the face and Steranko referred to it as a “Hulk teddy bear face” on twitter. 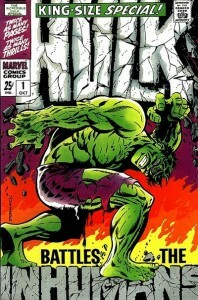 It’s funny I can’t tell you how many times I have looked at this cover and not seen a non Steranko face on the Hulk. When I look at it now, compared to Steranko’s other Hulk work, this story rings true… Steranko was known for keeping most of his artwork but might not have this finished piece. This info is all second hand so if anyone has anything else to add to this I would love to hear it. Oh yeah the book! The Hulk has found his way down to South America and quickly runs a foul with the locals. The Inhuman’s favourite pet Lockjaw shows up and after a run in of his own with the Hulk, he teleports the Hulk to another dimension full of evil Inhumans. In short order the bad guys are joined by Black Bolt’s evil brother Maximus. He see’s the potential in the Hulk for chaos and wants to put him to good use back in the Hidden land. Maximus the Mad is trying to free ancient weapon to wreak havoc and take over the Hidden Land refuge from Black Bolt. He transports the Hulk and evil Inhumans back to the Hidden Land and puts his plan into action. The Hulk wants no part of Maximus’s plan and tries to escape causing a lot of the chaos Maximus had hoped for, while he attempts to free the ancient weapon (Romnars absorbing machine). 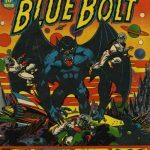 Black Bolt and Gorgon enter the fight and save the day (shortened version). Black Bolt offers the Hulk sanctuary which he politely refuses and he goes on his way. Maximus the Mad doesn’t forget about his encounter with the Hulk and he tries to use the Hulk for his own purposes in Hulk issues #119-120 less than a year later. 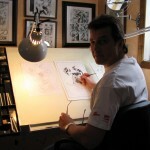 The book does contain one pin-up of note featuring 11 different renditions of the Hulk from the artists who have drawn him. Incredible Hulk Special #1 is still readily available at pretty reasonable prices in nice grades 8.0 – 9.2 ($72 -$235). 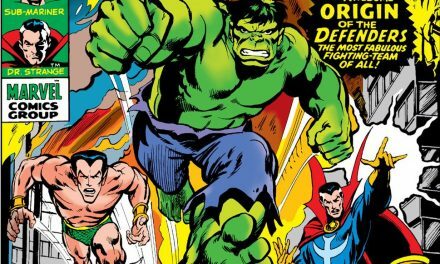 The iconic cover is still the main draw, and it is the only number 1 issue of the Hulk from the sixties you will likely ever be able to afford! The whole re-drawn face thing is still bugging me. 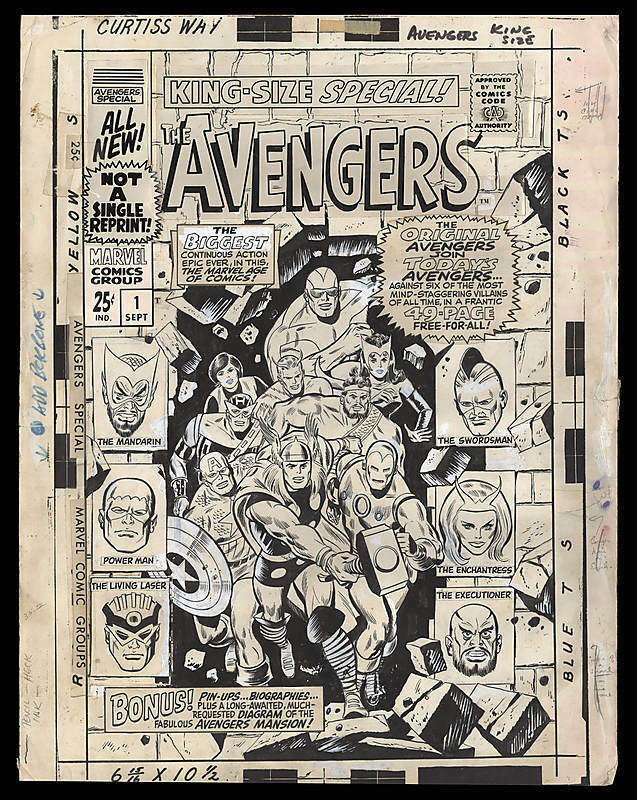 Cover and interior art by Jack Kirby. Inking by Vince Colletta. Story by Stan Lee. Thor’s first of two annuals begins with Thor and Loki traveling to Jotunheim in search of a road to Olympus. They come across and tangle with some Frost Giants. As the skirmish ends, Thor falls through a hole in the ground into a cavern. He follows a path seeking a way out when he comes to a bridge. Hercules is on the other side and tells Thor to wait until he has crossed before entering the bridge. Ahhh right! It’s a real Robin Hood/ Friar Tuck sort of moment and a well matched and fought battle ensues between our two sometimes swelled headed heroes. With no end in sight Zeus stops the fight. He commands the two part as friends. Zeus transports Thor back to Jotunheim and closes the cavern and places a mountain on the road. With the road block Thor joins Loki and they continue on their way, and Thor wonders if he will meet the powerful Hercules again. He doesn’t have to wait long as Hercules shows up in a couple of months in Journey Into Mystery #124. 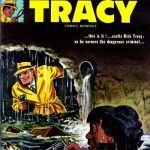 This book also has some classic reprints of Journey Into Mystery issues #85 (first Loki), #93 (first Radio Active Man) #95, and #97 (first Lava Man). The book itself has always been a bit of tough book to find in grade and the 1965 book is highest priced in our Arcs & Runs feature today. It is a book worth owning. Journey Into Mystery Annual 1 cover by Jack Kirby and Mike Esposito. Source. Our second Thor tale begins with Odin regaling his past glory in the Tournament of Titans (AKA the Olympics of Asgard) to Thor and how he is now relegated to being just a judge of the contest. The Warriors Three show and drag our hero Thor out to visit the festivities and join the contest. Meanwhile rotating around Asgard are the immobilized bodies of Loki and the Absorbing Man after their most recent defeat at the hands of Thor and Odin (Journey in to Mystery #120-123). 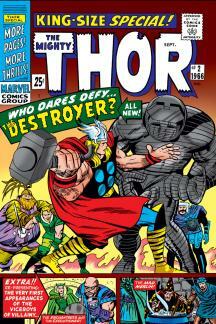 Loki is craving revenge and projects his soul in to the lifeless but deadly Destroyer shell of armour. We were just introduced to this terrifying armour in Journey in to Mystery #118 – 119. I must say I find the Destroyer one scary entity when activated. Thor and The Warriors have come across a brawl at a drinking establishment and meet four powerful ruffians Tyr, Brok, Galp, and Drom. Thor and company breakup the brawl and a challenge are issued for all eight of the battlers to meet at the Tournament of Titans. The challenge is accepted and the eight enter the ring and the fight is on. At the same time the Loki led Destroyer has arrived at the bridge guarded by Heimdall, who is swatted away like a flea. The Destroyer arrives at the Tournament of Titans and works his way through the contestants on his way to Odin. Even Thor can’t stop him. Loki announces to Odin that is he who is guiding the deadly armour and he intends to kill him. 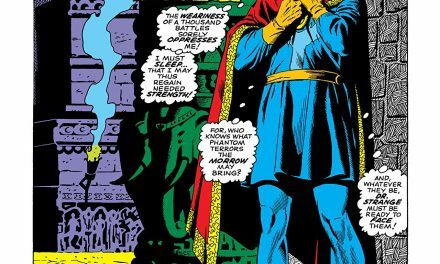 The Destroyer raises his visor and is about to unleash his deadly disintegrator ray when… we see what the all-seeing eye of Odin has been up to. He has sent Balder the Brave on a mission to find Loki’s body. Once found and just before the Destroyer can deploy his devastating ray, Odin casts a spell of forgetfulness on to the prone body of Loki. Loki’s soul returns to his body and the Destroyers shell of armour falls lifeless once more. The celebration begins as Odin declares that all of the combatants are champions. This book also contains reprints of Journey in to Mystery #96 & #103. It is much easier book to obtain than JIM annual #1 and a lot more affordable as well. 44th Overstreet values for the books featured in this segment of Arcs & Runs are listed below. And so ends this run of eighteen Marvel Annuals and Specials with original content. 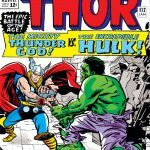 We’ll follow this with one more column featuring the best Marvel reprint and one shot annuals from the sixties later this year. Until next time have fun filling in the holes in your want list! I think our editor in chief has solved the puzzle on the Incredible Hulk Annual cover for us (well me at least). Scott always adds original art to my posts and helps to make Arcs & Runs alot better than when I send it in. 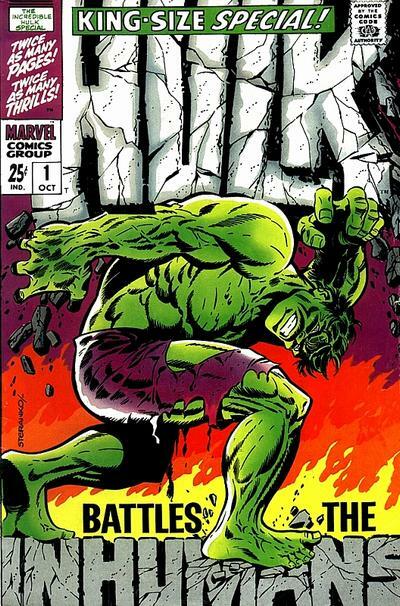 The original Steranko cover is posted here and it is has a clearly different face on the Hulk than the one on the finished cover (more fierce). I don’t know about the urban legend part of the post, but the re-drawn head by Marie Severin looks legit. Thanks Scott!! Great stuff Mike, especially the info about that Severin head on the Hulk! I hope next time you will answer once and for all the ultimate query relating to Marvel annuals: Which came first? Thanks Mel, I won’t make you wait on those annuals. The Marvel Comics database lists Millie the Model Annual #1 as Published January 1962 and Strange Tales Annual #1 as published September 1962. I will seek additional confirmation on this and report when I do the next annual A & R. Based on the info at hand – Millie wins! My hands down favorite of this group of annuals is Gene Colans’ DD#1 Annual. It was to me what annuals are all about !Plenty of guest stars and added features and the quality of Gene and John Tartagliones’ art was without equal and is still a favorite of mine. I always liked it too Dennis and I agree it’s amongst Gene’s best DD work.It’s still very reasonable in price for everything you get in this book. I believe the JIM Ann#1 is also the first appearance of Hercules… definitely a book worth owning. I always found the early annuals a little confusing in the way they were titled. At one point, I thought the Giant Size series were also annuals until they were group together as a series in itself. Bottom line, square bound = more pages = more fun. Yes Charlie JIM Ann. #1 is indeed the first appearence of Hercules. The numbering on the two Thor annuals is a tad confusing as well, as quite technically the Thor Annual or Special (more confusion) should have been a number #1 as well. I was on comic hiatus in 1974-75 and missed the Marvel Giant Size and DC 100 collecting strain when they were initially coming out. When I came back to comics in the late seventies the first couple I looked at were reprints so I didn’t bother with them. My brother did collect 58 of the 62 books in the Marvel run in the early eighties. He didn’t buy the two X-Men books because they cost too much (about $50 for #1) aaahhhhhh!! We still laugh (and cry) about those books. well , here in the Vancouver area , the Millie annual came out on a Tuesday and the Strange Tales came out on the Friday ! this , according to a long time collector friend of mine who was 22 years older than me . I’d have to agree with him because for over 30 years , new comics arrived on the newsstands on Tuesdays and Fridays , and he had a steel trap for a mind ! it may have been different back east where most of you folks live! oh , and Mike , like I said on your earlier post , I still wish I had bought that Millie back in the day when it was a lot easier to find a high grade copy than it is today ! I’d still like to read it one day ! another great post ! 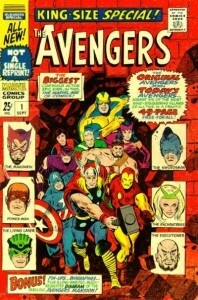 just love the Marvel annuals ! Ouch! I guess, in my heart of hearts, I have always hoped that the Strange Tales Annual beat Millie to the newsstand, simply because it is so much cooler. But, Millie in January and Strange Tales in September?! That’s just weird since I had always thought they put out the annuals during the summer months to cash in on those extra quarters the kids had on them during the holidays. January and September seem like crummy times to put out an over-sized book. Of course, the “House of Ideas” doesn’t always have the best ideas. The more I dig into these two comics, the more confused I get. It appears Millie was published first. When were both books distributed is a little harder to pin down. I will continue tracking that down. I have found and ad for Strange Tales Annual #1 in Strange Tales #101. The first four Millie annuals show a January publishing date. More digging required. I have always wanted Strange Tales Annual #1 to be the first and in one way it is. It is the first all reprint book. There is no publishing information inside the book and no art credits. The Millie the Model annual #1 contains original art and work. It pains me to say it , but I think this makes this annual more important than a re-print book as well. Millie is the Queen of Marvel annuals. I see an Arc & Run in her future. If that ad was in Strange Tales #101 that means they were advertising the release of that annual as soon as the title switched to superheroes in October of 1962. That might just jibe with your info about the annual coming out in September! The plot thickens! It was the Marvel Age of covers. Unsurpassed. So few images evoke so many memories as these covers do. They were specials that truly were special! Well put Rob. 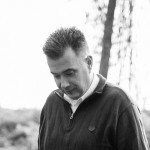 I would be very hard pressed to pick a stand alone favourite amongst the 18 books we reviewed. I have a soft spot for almost all of them and the 60’s “annual” or ” special” genre in general.